Amid the turmoil and paralysis in Washington as Congress attempts to deal with the ongoing economic crisis on Wall St. (for which, on a personal note, I simply fail to understand how it ever got to this point in the first place), another failure of leadership slipped quietly by yesterday as the 26–year-old moratorium on offshore drilling expired. The reactions to the expired moratorium reflect the contentiousness the issue has spawned in the past weeks and months as oil prices soared, nearing $150 a barrel over the summer (as of this writing, a barrel of oil is hovering around $100). And from there the debate ensues. Some agree wholeheartedly with Dye’s assessment, others think it is hopelessly naive (or worse) and that he fails to understand the economics involved. As with the climate change “debate” in general, it is hard to keep ones head above water when wading into this argument. People hold close to their cherished factoids and opinions about what offshore drilling means for our future. What seems clear to me is that offshore drilling will likely move forward in some fashion, and that it will make little long-term difference to our “energy independence” or the cost of energy. The age of fossil fuel will come to an end, and the best we can do is kick the can down the road, as is our preferred method of dealing with problems, as we can see all around us. 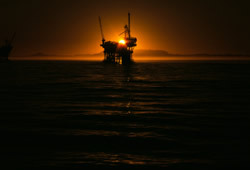 If there is a necessity to allow limited offshore drilling for no other reason than to calm the emotions of people facing the prospect of actually having to conserve energy and pay a price for energy more in line with its true cost, then so be it. Drilling offshore isn’t expected to truly solve either of those problems, but if it means we can finally get the leadership in Washington to start paving the way for the new energy economy, then do it, allow limited offshore drilling. I’ve come to expect little from George Bush over the years. But the abject failure of Congress to get anything done, to thus far allow renewable energy tax credits to expire at the end of the year and to let slip a 26–year-old moratorium on offshore drilling meant to protect our already beleaguered coasts and oceans, is a tragedy that leaves me heartsick. After the grandstanding from presidential candidates “suspending their campaigns” to “save the economy” and the high-stakes drama in Washington is long past, we’ll all be stuck holding the bag, as will our children and their children, from the lack of vision and leadership we witness in Washington today. You something about how people don’t want to “pay a price for energy more in line with its true cost.” If you think the gas prices are so high because environmentalists are making people pay the its true cost, you are wrong. The U.S. has become dependent on foreign sources for it’s oil, which is actually worse for the environment if you factor in the emissions from transporting said oil. Who do you think gets the money from the foreign oil we buy? Yes, people are emotional about this. They are trying to get from here to there to do their every-day jobs and they are going broke over it. If we lived in your dream world where the money we spent went to save the environment, at least we would know that our children will have a better environment because of this extra money we have to spend on gas now. But that is not reality! Do some research and find out where your money is going when you buy gas. Wouldn’t you rather it be in the hands of our self-elected government so that we can put our interest in the environment? But I guess if you have learned to expect little from our government, maybe you don’t bother to vote anyway. Thanks for you comment. I’m not always sure of the point you’re trying to make here, but I certainly agree that we are much too dependent on foreign oil. You can do some research as well and find out that the U.S. already exports much of our domestically produced oil and the oil companies set on enormous tracts of development leases for oil that go undeveloped. This whole thing about offshore drilling is largely a red herring to pander to the concerns of people of which you speak. Of course dependency on foreign oil is worse for the environment. But the idea that offshore drilling will have any significant impact on that dependency is misguided. The problem will not be solved by endlessly attempting to increase oil supply. Our future – America’s future – does not lie in a pool of oil. Here or anywhere else. I really don’t think you understand what my “dream world” might be. Finally, your notion that because I have issue with the energy policy of our current government might mean that I don’t vote is completely unfouded. Where do you get that idea?